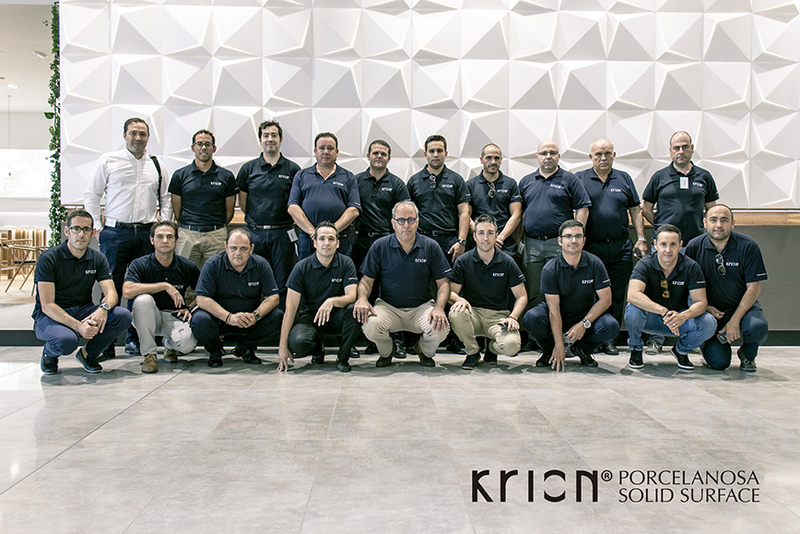 At the end of July, new training days were held for KRION® commercial technicians from Spain and Portugal in the installations of SYSTEMPOOL (PORCELANOSA Group), intended to encourage client consulting and service relationships in addition to excellent training quality. The intensive training was carried out over two days, within the dynamic training schedule of the company, serving to gather the KRION® commercial technicians from all over the peninsula in Vila-real. Qualified professionals provided instruction on everything related with the properties and manipulation possibilities of the material, as well as its excellent physical and mechanical characteristics, which allow sensational projects and designs to be created, earning KRION® a well-deserved international recognition. Developing the technical-commercial team’s consultations with clients was one of the key points on these training days. Closeness and professionalism in client service, which forms part of the company’s DNA each day, is possible thanks to over 30 commercial technicians, both in central offices and in branches in Spain and Portugal, exclusively dedicated to providing service and advice directly to architects, interior designers and KRION® transformation professionals. Additionally, as part of PORCELANOSA Group, the firm has an extensive network of commercial managers, with over 57 distribution stores and 25 logistics centres throughout the peninsula, even further strengthening the excellent relationship with the client, and being the differentiating factor in an increasingly competitive sector. The training also examined other pertinent factors of the material, such as the exclusive properties of the revolutionary K·LIFE, the loyalty and professional recognition programmes for transformers and the KRION®’s strong commitment to the environment, thanks to which it has obtained numerous certifications labelling the material as eco-friendly. Increasingly demanding, and in particular, increasingly informed clients require a more prepared, specialised professional to successfully face the new challenges which arise. SYSTEMPOOL has again committed to quality and the ongoing training of all its commercial technicians who make up one of the pillars of the company. Giving value to your workforce is essential to continue growing in a large-scale project with a distinctive international character, with the backing of PORCELANOSA Group.